It just doesn't get any more rags-to-riches in the poker world than Chris Moneymaker. A humble accountant from Nashville, Tennessee, this young husband and father of one won a seat at the 2003 World Series of Poker Championship Tournament by winning a $40 online satellite tournament. Because he was unable to pay for his trip to the tournament, his father and a close friend sponsored him with the promise of sharing a portion of any winnings that Chris won. It was a good investment, to say the least: Chris Moneymaker won the WSOP Championship, beating out such final table veterans as Phil Ivey and Sam Farha and taking home $2,500,000 in winnings. Though many people think Chris won due to luck instead of talent, he has silenced them with his results in big tournaments, like his recent second place on the World Poker Tour's Shooting Stars episode. 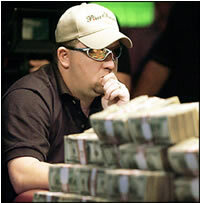 Christopher Bryan Moneymaker was born November 21, 1975, in Atlanta, Georgia. He attended the University of Tennessee where he received an accounting degree. He began working as an account in Tennessee, taking on a second job at a restaurant to support his expecting wife. Chris' professional career began overnight in 2003 when his $40 investment gave him a $2.5 million dollar return at the WSOP Main Event, where he battled his way to the final table and finally took out Sammy Farha's pair of jacks with a full house. Since then, Moneymaker has played in the World Poker Tour's Shooting Stars episode where he placed second earning $200,000, and he has participated in other world tournaments including World Poker Finals at Foxwoods, the WPT Invitationals, PokerStars Caribbean Poker Adventure, Bay 101 Shooting Stars tournament, and European Poker Tour in Monte Carlo. Chris started his own company, Moneymaker Gaming and published his autobiography titled Moneymaker: How an Amateur Poker Player Turned $40 into $2.5 Million at the World Series of Poker in 2005. He is also a spokesman for Harrah's Entertainment and PokerStars. As of 2017, he has won over $3.6 million in live tournament play. Before winning the 2003 WSOP Championship, Chris worked two jobs to make ends meet - one as an accountant and the other at a restaurant. Chris donated a portion of his WSOP winnings to cancer research.